Of course, picturing the enactment of beauty and horror in the vastness of the desert and on remote atolls resonates with the Romantic tradition of landscape painting. Phillips identified this “encounter” in my work even before I’d fully realized it. He also saw in it the conflicts of a rapidly developing cultural moment where much was felt to be at stake, including the re-absorption of new technologies in terms of the desires and predilections of earlier paradigms and media. It wasn’t just modes of image production and distribution that were changing; the parameters of visual art and cultural production in all mediums were shifting in response to the radical shift in how we process information. 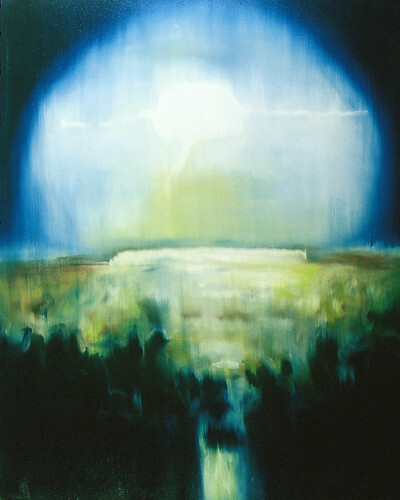 The sublime apocalypse inherent in both nineteenth-century landscape painting and the nuclear experiment was therefore a potent metaphor for what was happening socio-culturally in terms of technology and media, as well as an apt description for what had been occurring, quite literally, on (and under) the ground. Perhaps, once these declassified atomic-era documents were released into the public domain, the apocalyptic sublime could operate through representation itself, obliterating the very events depicted by superseding and replacing them, first in the public imagination and later in the writing and rewriting of official histories. JA: How has your pursuit of the apocalyptic sublime developed beyond your early nuclear landscapes? JG: Since the late 1990s, I’ve continued to forage for other kinds of images online. For instance, the painting Noon (Figure 2) is from a recent series of landscapes based on news photographs found on the Internet that depict a number of incidents occurring more or less simultaneously around the world. For these works, I generally suppress the contextualizing details that surround the source images. Sometimes, as with the nuclear landscapes, it’s important to retain the story line throughout the process and in the final work; but for me, in most instances, as with this project, it is essential to discard specifics so as not to close down the multiple meanings and readings of the work. You could say that I’ve spent the past decade playing between these two poles: the topical narrative versus the decontextualized incident. I am moving increasingly toward the latter, which I find to be the more fruitful direction. Once left with an ambiguous, pared-down entity to work from, a rich tension develops between what remains of the source image and what occurs on the canvas. Later, most importantly, this tension and ambiguity functions for the viewer as well: in the resulting painting, pictorial aspects of the source image are still present, but the anecdotal power of that content to determine or guide interpretation has been stemmed, leaving it to the viewer to project onto it. So to me, the primary distinction between Noon the painting and its source image has to do with how we engage and experience different types of images through the radically different delivery mechanisms at our disposal, which are generated by (and in turn generate) a variety of contrasting physical and metaphysical circumstances. Generally speaking, traditional painting functions as a one-of-a-kind object meant to be experienced one-on-one in physical space – an intimate document. By contrast, the source images I use are endlessly reproducible immaterial entities that are easily decontextualized, reducible to electronic bits, and treated as units of information with maximum distribution potential and high-gloss attraction. Calculated to catch the eye, the source image, even when initially produced to evoke empathy or reflection, is transformed by its mode of transmission into fodder for a narrative with endless turnover and few inducements to contemplation. by media image and artwork. In contemplating the painting, the viewer’s input – and at times their discomfort – is put in play. JA: Perhaps one of the most significant things to mark your generation’s work, and what distinguishes it from previous and later generations’ work, is that you not only straddle two radically different media paradigms, television and the Internet, but are also conversant in each of them? JG: I grew up in the television age of course, where TV was the predominant form of information distribution and entertainment, and its content became a kind of lingua franca for so many of us who watched it. But our relationship to content was passive; TV culture was all about top-down production – pure consumption. One of the difficulties was the feeling of futility in face of what was going on in the world, and the sense that one had no say whatsoever in anything; there were invisible hands calling the shots, and we could only sit back and observe and absorb. The Internet has reconfigured the way we watch and engage the world to some extent; it has even affected how television programming is implemented. We may still be passive consumers for the most part, but we are no longer purely passive, as we strive for social interaction – “networking” – and actually exert a kind of influence on a variety of fronts. When the Internet first became popularized in the 1990s, those of us working with it began responding to world news and polemic as we received it, discussing and even creating web-based artworks, which viewers halfway around the world could watch or interact with. This phenomenon has grown and upped the ante for producers of high-gloss top-down media spectacle – there’s no going back to the old couch potato model. The implication is that everyone can have a direct hand in changing things – at the very least, in making and distributing their own work – and that this direct contribution can be achieved in real time. Los Angeles artist Mike Kelley put it beautifully in an interview he did with Glenn O’Brien in 2008 (O’Brien 2008). He says we’re inundated with media sludge and white noise, but we can’t see it or distinguish it; “we’re surrounded by invisibility,” but art is there to make things visible. He says everybody should have a chance to whack away at the white noise, and this should be taught in the public school system. Of course, a typical problem faced by art students and experienced more or less by artists everywhere is how to intervene in the cultural narrative at large: how to “be relevant,” how to make one’s work matter, how to insert it into the larger picture. It took me years to see that this approach is completely backwards; it’s not about finding a way to insert yourself into the world, but rather about doing something like what Kelley is describing: addressing the white noise by engaging and transforming it, appropriating and mashing it. My way of attacking the problem is to re-mediate world events by painting them. In the process, the world itself becomes more relevant to me. your work, especially after Meiselas’s lawyer sent a “cease and desist letter,” claiming copyright infringement of Meiselas’s photograph? JG: Molotov (Figure 3) was the centerpiece of a project called “Riot,” which explored the apocalyptic sublime not through landscape, but through the locus of the figure in an extreme state. In that sense it was a departure, and it was an adventure; it served to further develop some of the rudimentary ideas I had about re-mediation and painting that incorporates found images. I came across the source image for Molotov, a ponytailed, Molotov cocktail-wielding youth, on an anarchist blog, and saved it to a desktop folder with other images that I would later sort through for making paintings. I eventually painted 15 contorted, emotionally fraught figures that suggest scenes ranging from “emo” rock performances and lovers embracing, to religious celebrants and bloody uprisings. As with my technological landscapes, I wanted to allow paint – the way I paint – to function as the de facto agent of transformation. I pared everything down to the figure, leaving it intact but simplified, its contortions amplified. I had just begun to explore the idea of the figure and the sublime, and it was clear that there were a number of factors that made these works different from the landscapes, particularly when choosing to render more-or-less accurate likenesses, which makes pictorial baggage and contextualizing details that much trickier to negotiate or discard. In early 2004 I had a solo exhibition of a selection of these works in a New York gallery. As it turns out, the figure in Molotov was recognizable to some people; he is the central figure of a rather famous photograph of the Sandinista revolution, shot in 1979 by Susan Meiselas. Uncannily, my found jpeg was a fragment of the emblematic image of Susan’s work in Nicaragua, and I was made aware of its provenance in an email message sent by another photographer who expressed no uncertain amount of umbrage. The email was followed some weeks later by a cease and desist letter sent by Susan’s lawyer accusing me of “piracy,” and demanding, among other things, that I sign over the rights to the painting. JA: Unwittingly, then, you had inserted yourself into the contemporary debate over digital technology and intellectual property? JG: Yes, and before long I found myself being cast as an “appropriation artist,” though I had never been particularly invested in the idea of appropriation as a provocation. Obviously, the practice of repurposing found imagery is not new, and while the label “appropriation artist” may serve as convenient shorthand, it is also misleading, since all artists reference and borrow – we all appropriate on some level – which is largely how visual language functions. Art is “open source,” it always has been! One very important thing to emerge from all of this was a real sense of the rifts that exist within the global visual arts community, which is actually several communities, each holding starkly contrasting attitudes toward copyright and concepts like “originality.” These attitudes have everything to do with the different economic models by which artists may earn a living, and with the current erosion of some of those models due to the cataclysmic shift towards digital paradigms; some have traditionally relied upon copyright (commercial artists, photojournalists, illustrators), while others’ success has had little if anything to do with it (artists who work through the gallery system). With the advance of digital technologies and the ease they have brought to the formerly cumbersome activities of copying and distribution of content, these rifts have grown as people become increasingly panicky about how to control the uses of their work, earn licensing fees, or whatever else copyright formerly adequately functioned to protect. This panic, of course, is the result of fear-mongering, and has fueled the steadily rising number of high profile lawsuits and political posturing by proponents of change on either side of the “copyright wars.” And, of course, by opportunistic lawyers who see the visual arts as fresh, as yet unregulated or loosely regulated territory, just ripe for staking out. JA: To what extent do you think that the concept of copyright is now paramount in interpreting the differences between the respective practices and contributions of photojournalists and painters to contemporary art? JG: Well, I actually think the current discussion of copyright sidesteps or obscures some really interesting ideas, while over-emphasizing the importance of property and control. We’ve become caught up in this problem at the expense of other, more fruitful and interesting conversations. One thing to keep in mind, despite our obsession with property, is the fact that visual art functions according to the principles of open source, and it always has been open source – art can’t be made otherwise. In other words, borrowing and direct referencing – various forms of “copying” – are the basis of creativity. You would think we might understand that by now, that our understanding of art history would take us well beyond the cliché of artist as lone inspired genius conduit. In truth, all creativity is collaboration, whether one is conscious of it or not. What we call “influence” is nothing if not quotation and allusion. Our culture is generated and driven collectively, and the whole point is to dip in and take parts and change them, to make them “new.” To make art is to copy on some profound level, and to copy is of course to communicate: to act as receiver, transformer, and transmitter. Here’s where Mike Kelley comes in again, and his call for us to parse the noise. Of course we reinterpret and misremember what we’ve seen, and that is part of the process – misremembering is an art! As for the difference between what painters and photojournalists do, the intriguing thing is how intensely their priorities differ. This became clear after my discussion with Susan Meiselas. Generally, the photojournalist feels responsible for and ethically bound to their subject, prioritizing the melding of context and image, regardless of how futile such an endeavor may be in face of media manipulation and other a-historical processes of omission and perversion of meaning. The painter, by contrast, rightly avoids prescriptives that might close down or prevent multiple interpretations and readings, resisting internal and external pressures to dictate meaning. Susan and I elaborated – and must continuously reassert – the conditions we each feel to be essential to the production and integrity of our respective processes. At the conference, our approaches were well-received, accepted as valid, each on their own terms, and I felt that by the end of our talk most of the audience in attendance understood that we – both painters and photojournalists – must be allowed to adhere to the standards and traditions of our respective practices without the imposition of inappropriate or obstructive conditions. I speak of conditions imposed by the blunt instrument of current copyright law, of course. By the end of our talks, it seemed clear that the realms of photojournalism and painting indeed exist in parallel universes, and that we must allow them to continue to coexist, contradictions intact. Susan and I knew we’d cleared some kind of hurdle. We were later invited to edit our talks and publish them together in Harper’s: “On the Rights of Molotov Man: appropriation and the art of context” (Garnett and Meiselas 2007) alongside Jonathan Lethem’s ingenious pastiche “The Ecstasy of Influence,” which lampoons some widely held assumptions about originality. The story of Molotov Man has since been taught in undergraduate and graduate curricula across various disciplines in media studies and art law, and has been reprinted in a textbook for NYU’s expository writing program (Morgan, Mischkot, and Bennett 2008). And yet, the story’s usefulness as well as its true point, to demonstrate the intrinsic value of both approaches, seems to have gotten lost in the morass of the “copyright wars.” While the Harper’s article does not argue in favor of either position, students and teachers alike seem to want to take sides. Perhaps this polarization is a reflection of the combative nature of the classroom, or of the current impasse in the copyright conflict, but it makes me think that we have to struggle to get beyond our preoccupation with copyright – and with property – which tends to dumb everything down at the expense of more intellectually compelling questions about how we perceive and engage the world. JA: Even so, any critical evaluation made of your contemporary artworks on the apocalyptic sublime might suggest that the larger, more intellectually compelling questions that you raise are really those introduced by early nineteenth-century Romantics? JG: If you’re suggesting that I’m a latter-day Romantic, there’s no denying it! But, my inquiry reaches beyond nineteenth-century preoccupations with nature and the sublime, into the contemporary conflict with technology and technoscience, and the way the media landscape has infiltrated our experience. This feeds into a whole set of developments in late twentieth and early twenty-first century painting. actually using paint. I feel more of a connection to this work of Ruff’s than I do to a lot of contemporary painting. Ruff’s series especially makes sense, I feel, when taken in relation to certain painters working since the photographic “look” of Richter, Celmins, et al. I’m thinking of painters like Marlene Dumas and Peter Doig, who source their work through the media and through photographs. Yet the “photographicness” of their source imagery has been superseded, reconfigured by a sensual, more explicitly painterly trope (Schwabsky 2009), where photography – or its “look” – is transfigured and literally reclaimed by the hand and by the human scale. But let’s get back to the problem of “the sublime” for a moment. In his recent study on the end of representation (Elkins 2008), art historian and critic James Elkins discusses the classical origin and various uses of the concept of “the sublime” up through Kant’s example of a vast and stormy sea, where one overcomes the abject fear of drowning by conceptualizing one’s distinctness from that sea. Then in the nineteenth century, the notion of the sublime gave rise to the image of the lone figure, separate and closed-off from nature, thwarted, drowned by longing. We now face Kant’s stormy sea in the form of mass media. It is man-made, technological, and cultural, and through it, ironically, we strive to close the gaps in our daily experience of nature. We live in awe of the media itself, which is manifold, vast, and unknowable; it is an abyss over which we have no real control, but which feeds and controls our lives. We have encircled the earth with it. The media is Kant’s stormy sea, but unlike nature, it can’t sustain us. JA: Finally, if the media spectacle cannot sustain us, what can? How can artists continue to participate in and contribute to contemporary culture? JG: Sometimes I feel lost in the media – the news and entertainment spectacle – as though I’m drowning in it; there is a vertiginous aspect to dealing with media, as though one were scaling something very large, really too large to grasp. This feeling seems to have carried over into the paintings I’ve been working on lately (Figures 4–8), where the horizon line and other points of reference have disappeared. in those solitary processes such as painting, and for non-artists and amateurs, these new possibilities of engagement are relatively new and exciting. Just because a person isn’t an artist doesn’t mean that they can’t be creative. And a creative life is profoundly sustaining. 1. This interview was conducted by email during the Fall of 2009 through the Winter of 2010. Joy Garnett and John Armitage would like to thank Bill Jones, Joanne Roberts, and the editors of Cultural Politics for their constructive comments on earlier drafts. 2. “Comedies of Fair U$e: A Search for Comity in the Intellectual Property Wars,” was a conference organized by the New York Institute for the Humanities at New York University, Friday, April 28 through Sunday, April 30, 2006. Elkins, James. 2008. Six Stories from the End of Representation: Images in Painting, Photography, Astronomy, Microscopy, Particle Physics, and Quantum Mechanics, 1980–2000. Stanford, CA: Stanford University Press. Garnett, Joy and Meiselas, Susan. 2007. “Portfolio – ON THE RIGHTS OF MOLOTOV MAN – Appropriation and the art of context.” Harper’s Magazine, 313(1881) (February): 53–8. Morgan, William M., Mischkot, Jono, and Bennett, Nat. 2008. The Advanced College Essay: Education and the Professions. New York University, Expository Writing Program. Boston: Pearson Custom Publishing. O’Brien, Glenn. 2008. “Mike Kelley.” Interview, 38(10) (December/ January): 174–9, 201–3. Phillips, Christopher. 1999. “Joy Garnett At Debs & Co.” Art in America, 87(11) (November): 135. Ruff, Thomas and Simpson, Bennett. 2009. Jpegs. New York: Aperture. Schwabsky, Barry. 2005. The Triumph of Painting. London: Jonathan Cape. Schwabsky, Barry. 2009. “The Human Metaphor: Marlene Dumas and Barkley Hendricks.” The Nation, 288(8) (March 2): 34–5.